CONTACT Kwantlen for admission information. facilitate the role of nurses as communicators." Nursing informatics is a combination of computer science, information science, and nursing science, designed to assist in the management and processing of nursing data, information, and knowledge to support nursing practice, education, research, and administration (Graves & Corcoran, 1989). "Information is an essential phenomenon of study for an information-based discipline such as nursing," (p. 2). Nursing informatics can be applied to model the human processing of data, information, and knowledge within a computer system in order to automate the processing of nursing data to information and the transformation of nursing information to nursing knowledge. "In the current Information Age, the doubling of knowledge every five years and the increased specialization of knowledge make it imperative that nurses have access to the latest scientific information to assist in the delivery of high quality care," (Hudgings, 1992, p.7). 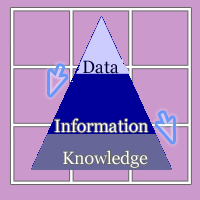 Toffler (1990) described the 1990's as a new era for informatics, the process of gaining power through the data-information-knowledge triad. This era continues as we enter the new millennium. The need for nurses to feel comfortable working with computerized data and information is escalating. Computer Applications in Nursing Education and Practice, p.10. Health and nursing information science is the study of how health care data is acquired, communicated, stored, and managed, and how it is processed into information and knowledge. This knowledge is useful to nurses in decision-making at the operational, tactical, and strategic planning levels of health care. Information systems used in health care include the people, structures, processes, and manual as well as automated tools that collect, store, interpret, transform, and report practice and management information. The realization that health care data and information can be effectively managed and communicated using computer systems, networks, modems and telecommunications has catalyzed the emergence of the science of nursing informatics. As Virginia Saba (1992) predicted, "By the turn of the century, most health care delivery systems will function with computers and will be managed by computer literate nurses. I believe, that by the turn of the century, "high tech and high touch" will be an integral part of the health care delivery system," (p. xv). At present, nursing informatics is an emerging field of study. National nursing organizations support the need for nurses to become computer literate and versed in the dynamics of nursing informatics. We are at a transition period. 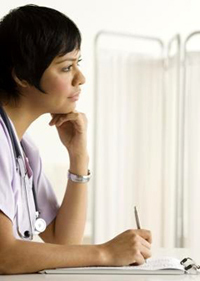 Becoming educated in nursing informatics is, for the most party, a self-directed and independent endeavor. Programs that offer basic and further education in nursing informatics are beginning to spring up around the globe, but many more are needed to provide easy access for motivated nurses. Canadian advances in nursing informatics are in the infancy stage, yet, show promise for the future where this science will contribute significantly to our envisioned, new health care delivery system. The Canadian Journal of Nursing Informatics, ( www.cjni.net ) was created to encourage Canadian nurses and nursing scholars to share their research and insights into the implementation of nursing informatics into the Canadian healthcare syste. NEXT: HISTORY OF NURSING INFORMATICS.... .